Great Kia Niro car Leasing & Contract Hire Deals. Our Kia Niro Lease Deals. If you started out wanting to buy a small 'Juke'-style Crossover, you probably weren't expecting to be considering a Hybrid. And, if you started out wanting to buy a Hybrid, you probably weren't expecting to be considering a small Crossover. Get over it. In this Niro, Kia has a car that does a pretty good job in combining fashion and frugality and if you're shopping in either of these segments, it's well worth your consideration. Inevitably, as with any blended concoption, there's an element of compromise here. Some other Hybrids are more frugal, just as some other small Crossovers are more fashion-conscious. Take the view that life is about effectively managing compromise though and you're probably the sort of person who'd really appreciate what Kia has tried to do here. This Niro is, after all, comfortable, spacious and well equipped. It looks good and overall, will almost certainly work out cheaper to run than a comparable diesel alternative. That doesn't necessarily mean it'll be right for you, but there's no doubt of one thing: in terms of the kind of wishlist that a buyer in this part of the market might have, the Niro ticks a lot of boxes. The Niro is Kia's first ever dedicated hybrid model, but actually, the company is no stranger to automotive electrification. Hybrid versions of the marque's larger Optima have been on sale in the USA since 2011 - and a Plug-in version of that car is available here. Plus Kia has been marketing a completely battery-powered version of its even smaller Soul Crossover model since 2014. The Niro though, sees the Korean maker's futuristic engineering showcased to a much wider audience and will be key in allowing Kia to meet its target of reducing CO2 emissions across its model line-up by 25% by the year 2020. It's certainly been cleverly developed. Instead the old-fashioned nickel metal hydride batteries and belt-driven CVT auto gearbox you get in, say, a more expensive Toyota Prius, here there's properly modern lithium-ion battery technology and a smoother, more sophisticated dual-clutch auto transmission to work with the hybrid system. Plus there's good looks, decent interior space and up-to-the-minute media connectivity in a car neatly positioned in size between Kia's two biggest sellers, the cee'd family hatch and the Sportage family Crossover. The Niro is available in either conventional Hybrid or Plug-in PHEV guises. Either way, the hybrid technology is mated to a 105PS 1.6-litre petrol powerplant. In the conventional hybrid variant, this is mated to a 32kW electric motor. In the PHEV model, it's mated to a more powerful 44.5kW motor. In both cases, the total system output - 141PS - is pretty much the same either way, the petrol engine and the electric motor combining effectively to provide 265Nm of torque, enough for sprightly acceleration away from standstill. As you'd expect from a hybrid, regenerative braking is used to send power back to the battery, but Kia says it's paid special attention to brake feel, reducing the grabby nature that you get from the brakes in other hybrids. The transmission is the latest version of Kia's 6DCT CVT auto 'box, re-engineered specifically for use with the Niro's advanced hybrid powertrain, delivering a more direct and immediate response - and a more entertaining drive - than a traditional continuously-variable transmission would. The Niro's 6DCT is able to shift gears automatically, while keener drivers can pull the gear lever towards them to put the car into Manual Sports mode and allow manual shifting. A series of measures have been adopted to ensure low levels of noise, vibration and harshness. These include specially-designed asymmetric engine mounts to manage powertrain movements at each point in the front subframe, high density under-bonnet insulation and a sound-deadening acoustic shield with a special support structure to improve the sound of the engine accelerating across the most used range of engine speeds. The Niro occupies a useful space within the brand's model line-up in terms of its size. It's 4,355mm in length, 1,800mm wide and 1,535mm tall, making it smaller overall than the brand's larger Sportage Crossover, though occupying a larger footprint than the cee'd hatchback or the Stonic small SUV. There's nothing particularly exciting about the shape but it's likely to chime with buyers at the larger end of the compact Crossover segment and has a relatively sleek 0.29Cd drag factor. The relatively wide stance is intended to portray stability and a low centre of gravity. With a relatively long bonnet, short overhangs, elevated headlamps and rising shoulder line, the Niro's styling is certainly a break away from more sensible Prius-style hybrid models. The silhouette tapers slightly towards the rear of the vehicle, ending in a subtle rear roof spoiler, elevated tail-lamps and a wide, squared-off rear bumper. Combined with bold wheel arches, the design places greater visual volume over the rear haunches. Inside, the cabin has been designed to give an impression of space and modernity, with a wide dashboard and defined horizontal lines. 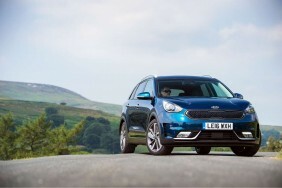 The Niro follows the most recent Kia models in offering high quality, soft-touch materials throughout the interior. There's decent boot capacity too - 421-litres. For buyers of the conventional hybrid Niro model, there are four trim grades currently on offer - '1', '2', '3' and 'First Edition'. Pricing starts from around £21,500. You'll need a budget closer to £25,000 for the PHEV version. All Niro models are comprehensively equipped with comfort, luxury, connectivity and driver assistance features. Every version has a Lane Keep Assist System, Hill-start Assist Control, Cruise Control and a Speed Limiter. Every Niro also has a DAB radio and is able to support Bluetooth smartphone connectivity and music streaming. Plus all variants get 16-inch alloy wheels, dual automatic air conditioning, an automatic windscreen de-fogging system, LED daytime running lights and tail lights, a 3.5-inch TFT supervision cluster, all-round electric windows and electric exterior mirror adjustment, USB and AUX ports and a trip computer. Buyers can specify a single-tone cabin, available either in black or dark grey, and upholstered in cloth, cloth and leather or full genuine leather. And there's a choice of seven colours, plus a selection of 16 or 18-inch alloy wheel designs. The Niro is fitted as standard with seven airbags for optimum passive occupant safety, with airbags for driver and front passenger, driver knee, first row side airbags and first and second row curtain airbags. ISOFIX child-seat tether and anchor points are fitted as standard to the second row of seats, to safely secure children. So, how do the figures stack up? Well, let's look at the conventional hybrid model most will choose. This car's headline efficiency figures can't match those of Toyota's Prius but they're still pretty impressive: 74.3mpg on the combined cycle and 88g/km of CO2. That's achieved using some impressive tech. The Niro uses the a Lithium-Ion Polymer battery that is both compact and powerful - so much so that Kia has been able to do away with a 12v battery in the car. Kia has also developed a Predictive Energy Control system to use navigation data that predicts changes to the road ahead and maximises the efficiency of the hybrid system. The 1.56 kWh lithium-ion polymer battery pack is the lightest and most efficient pack used by Kia to date, with up to 50% higher energy density and 13% greater energy efficiency than the battery packs found in key rivals. Weighing just 33 kg, the Niro's battery pack - with an advanced power relay - allows the battery to regenerate electrical energy under deceleration. We ought to cover the alternative Plug-in Hybrid Niro variant too. This derivative puts out just 30g/km of CO2 and is supposed to be able to return a combined cycle reading of around 130mpg - those figures based on NEDC calculations assuming that owners will be making full use of the 34-mile driving range potential provided by this variant's 8.9 kWh battery. Charging a Niro Plug-in Hybrid takes 2hours 15mins using a 3.3 kW AC charger.